From Texan-made Bavarian-style Oktoberfest beer to Cucumber Cooler Beer from Norway, the global beer market has seen a wealth of interesting product innovation over the course of 2017. Using Mintel Global New Products Database (GNPD), our team of expert analysts monitor global product launches in order to track the latest category innovation and forecast opportunities for brands. Here, Jonny Forsyth, Global Drinks Analyst at Mintel takes a look at some of the most innovative beer products recently launched across the globe, just in time for Oktoberfest. Austmann & Wettre Bryggeri, Cucumber Cooler Beer, NorwayAdding a vegetable twist, this Cucumber Cooler Beer is described as a fruity Saison with cucumber, red peppercorn and lemongrass and is brewed in a co-lab between Austmann and Wettre Bryggeri. Kriek de Ranke, Belgian Sour Ale, BelgiumKriek de Ranke Belgian Sour Ale is made with a base of old flemish beer, lambic and sour cherries. The unpasteurised and unfiltered product is re-fermented in the bottle. Lindheim Ølkompani Friendship Series, Wild and Mild Wild Ale, NorwayThis Mild Wild Ale is made with 40% farm fresh apple juice. The ale is fermented in oak with a blend of Crooked Staves house yeast and yeast/bacteria from coolship beer. Dreher Sörgyárak, Lager Beer with Mosaic Hop, HungaryDreher Mozaik Komlós Világos Sör (Lager Beer with Mosaic Hop) is made with a special process using Mosaic hop. It features an aroma intensity of six and hop intensity of seven (both out of 10). 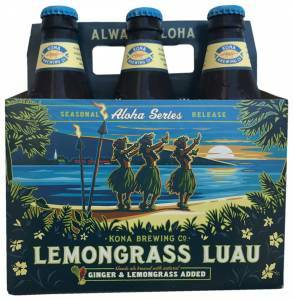 Kona Brewing, Aloha Series Lemongrass Luau Blonde Ale, USASaid to be inspired by Hawaiian luau, Kona Brewing Co. Aloha Series Lemongrass Luau Blonde Ale is brewed with natural ginger and added lemongrass. Browar Jablonowo, Porter Beer with Plum, PolandManufaktura Piwna Browaru Jablonowo Porter Podbity Sliwka (Porter Beer with Plum) is a limited edition product. It is described as a pasteurised imperial Baltic porter dark beer featuring the colours of Ruby stone and coal black. 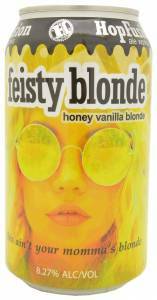 Feisty Blonde Ale, HopFusion Ale Works, USAHopFusion Ale Works Feisty Blonde Ale is a bronze/golden ale that combines deeply aromatic orange blossom honey with a touch of pure Mexican vanilla and raw piloncillo to round out its smooth finish. This product is brewed with four grains and two varieties of hops for balance, but unpasteurized and unfiltered to allow the natural essence of the citrus blossom to shine. Botanicals Bazový Kvet s Tymiánom a Citrónom, Plzensky Prazdroj, Czech RepublicBirell Botanicals Bazový Kvet s Tymiánom a Citrónom (Elderflower with Thyme and Lemon Beer) is a blend of non-alcoholic beer with flavours of elderflower, thyme and lemon. The pasteurised product is naturally matured for 19 days. 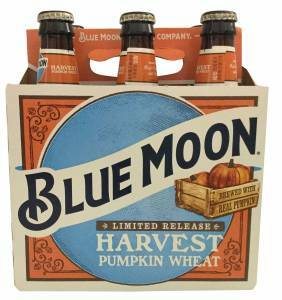 Harvest Pumpkin Wheat Beer, Blue Moon Brewing, USABlue Moon Harvest Pumpkin Wheat Beer is a kosher-certified product which is said to be creatively brewed to complement the season, and combines cloves, nutmeg and cinnamon along with real pumpkins. 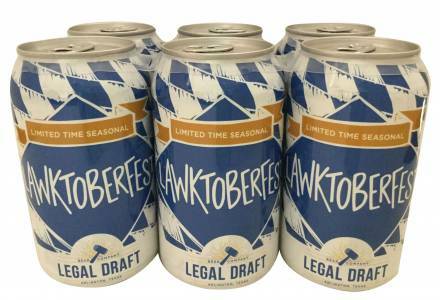 Lawktoberfest Beer, Legal Draft, USALegal Draft Lawktoberfest Beer is a limited time seasonal, classic Bavarian style Oktoberfest beer with a hint of orange in its clear body, a slight toast of malt, and a crisp finish.. This product features the Go Texan logo. 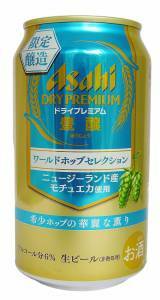 Dry Premium Hojo Premium New Zealand Motueka Hop Beer, Asahi Breweries, JapanAsahi Dry Premium Hojo Premium New Zealand Motueka Hop Beer is a new limited edition variety. This Japanese product features rare Motueka hops produced in New Zealand to offer a rich aroma.